Local wildlife carer Suzie Cooper with the tiny Mountain Pygmy-possum she cared for until it was strong enough to be released back into the Kosciuszko National Park. Photo: Elena Guarracino. A young endangered Mountain Pygmy-possum is very lucky to be alive, thanks to the sharp eye of a hiker in the Kosciuszko National Park and efforts of local wildlife group LAOKO. The tiny possum was found in a very poor state, covered with ants, near the Thredbo chair lift, during a bout of hot weather in January. Happily, a hiker spotted the possum, which could easily be mistaken for a mouse, on the Main Track and handed it to National Parks and Wildlife rangers. 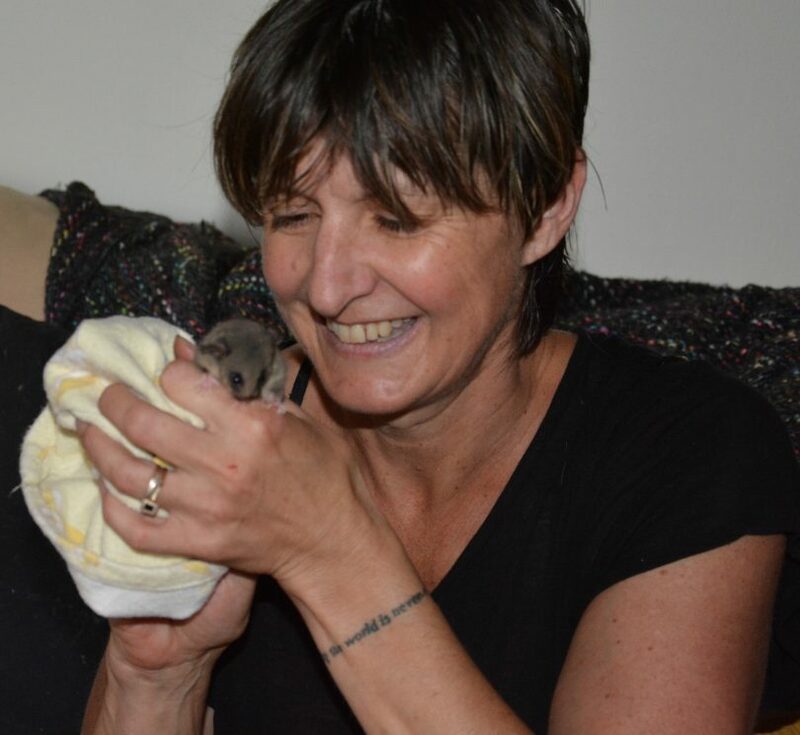 The juvenile female possum, estimated to be about two or three months old was given to an experienced LAOKO (Looking After Our Kosciuszko Orphans – Snowy Mountains Rescue) carer Suzie Cooper, who said the Pygmy-possum was only just alive when it was rescued. “It was severely dehydrated and malnourished,” Ms Cooper said. Under Ms Cooper’s expert care, the Pygmy-possum rapidly doubled in weight and became quite robust. Ms Cooper said the possum was fed a special Pygmy-possum milk formula until it was rehydrated and strong and also given nuts, fruit and insects. Adult Mountain Pygmy-possums weigh about 40 to 80 grams and live between one and 12 years, measuring about 28cm, including a very curled (and cute) 16-centimetre tail. They are omnivorous, feeding on the Mountain Plum Pine and various insects, including Bogong Moths. In taking on the care of this young fragile life, LAOKO sought the advice of a Mountain Pygmy-possum expert. “They have to be kept cool, below 25 degrees, and provided with a simulated tunnel to hide in,” Ms Cooper said. “She is very resilient and easy to look after, and she bites,” Ms Cooper added. After two weeks in care, the possum was released back to the area near where it was found in boulder fields at South Rams Head, with the assistance of National Parks and Wildlife staff. It is likely the rescued Pygmy-possum was victim to the crash in the numbers of Bogong Moths which migrate every summer to the Kosciuszko National Park. In summer, Bogong Moths make up about 25 per cent of the Mountain Pygmy-possums’ diet, supplemented by the Mountain Plum Pine fruit and other plants. Bogong Moths are very rich in protein and fat, enabling the possums to increase their body fat reserves before winter. Over winter the Mountain Pygmy-possum hibernates, living off its stored body fat and awakening occasionally to feed on seeds stockpiled nearby. Bogong Moths are an extremely important component of their diet, allowing Mountain Pygmy-possums to survive the cold, harsh winter. The moths hide in caves and cracks in alpine areas, where they rest, going into a torpor state (aestivation) during the summer months, before returning to northern NSW to breed. 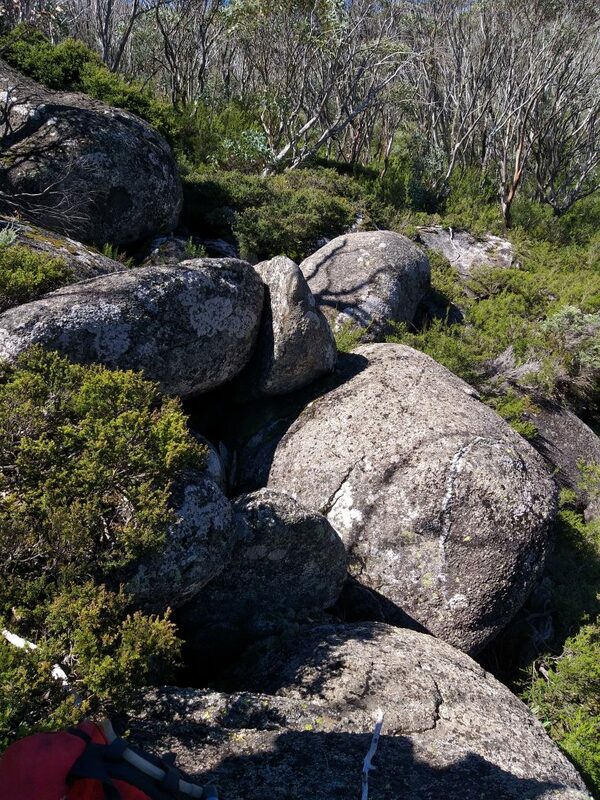 Boulder fields at South Rams Head in Kosciusko National Park – Mountain Pygmy-possum habitat, where the possum was released in February. Photo: NPWS. Alpine ecologist at the Australian National University, Dr Ken Green believes that climate change and recent droughts in areas where the Bogong Moths breed in grasslands in northern New South Wales and southern Queensland are the cause of the crash in moth numbers. “Ian Commons (CSIRO) and I have been looking at Bogong Moths for a combined period of 70 years. Between the two of us we have been researching Bogong moths since 1951,” Dr Green said. Dr Green said he has never seen it like this before, and for the second year in a row young Pygmy-possums have been dropped out of the pouch by female Mountain Pygmy-possums, and found dead in their mothers’ pouches. 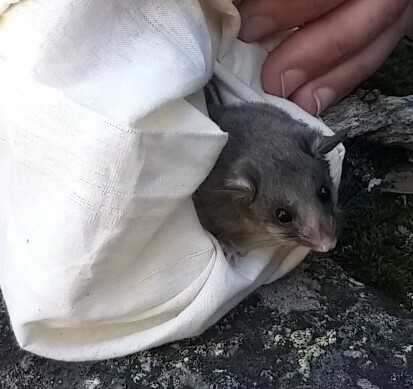 Dr Green said in 2018, at a site at South Rams Head in Kosciuszko National Park, which is a Mountain Pygmy-possum habitat, only 1,000 moths were found. “This year only six moths were found, and a week ago there were none,” Dr Green said. With a declining total population of less than 500 Mountain Pygmy-possum adults in Kosciuszko National Park, this little rescued possum will hopefully go on to breed and help avoid the extinction of this remarkable marsupial. A well researched story & poignant reminder of the delicate interdependence of ecosystems that have suffered in the wake of human endeavour.